In response to my previous post, I got an email from Nick Matzke, a biology grad student at Berkeley who formerly worked for the National Center for Science Education (a prominent anti-intelligent design group). He suggested that I could respond to his email on his blog, so I thought I’d do so. There was a lot to his email but I’ll pick out one line of argument. Unfortunately I think it shows that you’ve been reading ID literature a bit too much without detailed critique! My primary beef is your uncritical use of “chance”, which exactly mirrors the uncritical use of “chance” by Dembski, Ratzsch, et al. Basically, except perhaps in the case of quantum mechanics, the term “chance” is *scientifically* just a statement about human uncertainty in an outcome due to its being caused by deterministic causes that interact in a complex and unpredictable way. But in the ID literature, and in your blog, “chance” is opposed to “design”, and when this occurs, “chance” implies metaphysical meaninglessness, “things just happen”, God-is-being-ruled-out, etc. Even worse is when the term “chance” is equated with “natural causes”, which is also something you do, following the ID guys. But natural causes as commonly understood are anything but “chance.” It is not “chance” that water flows downhill, that canyons form as a result, that hard rocks erode one way and soft rocks another, etc. Similarly, the key force explaining “design” in biology, natural selection, is explicitly and obviously the opposite of anything resembling a “chance” process. To sum up: The correct thing to do, if one is interested in this, is ask if something is due to “design” or “natural causes”, not “chance”. If that reaction didn’t have any substantive effects, we would probably conclude that the reaction happened as a result of chance processes. To be honest, I don’t think Matzke’s criticism is especially important; I see this as just an issue of terminology. It’s true that intelligent design proponents often use the term “chance” to refer to undesigned processes, and I could see how someone who wasn’t familiar with what they were talking about would assume that they are talking about purely chancy processes, when in fact they are not. But once one gets familiar with the terminology, one knows what intelligent design proponents are talking about, and I don’t think it’s a big deal to use the term “chance” the way that intelligent design proponents do, as long as everyone is clear about what it means in this context. But that said, I think that chance plays a more fundamental role in science than Matzke thinks it does. There are two ways in which this is the case. First, Matzke quickly sets aside quantum mechanics, but in fact quantum mechanics is the most fundamental theory we have concerning physical objects and how they interact. And, according to most interpretations of quantum mechanics, most all physical processes are chancy processes, in the sense that there are multiple possible outcomes that have a non-zero probability of occurring. For example, consider the textbook example of a Newtonian deterministic process, a billiard ball that knocks into another billiard ball and starts it moving. According to quantum mechanics, the wave function of a particle has non-zero value in an unbounded region of space, and that means that there is some non-zero probability that, when the location of the particle is measured, the particle will be arbitrarily far from its starting point. The same holds for collections of particles, and hence, when the billiard ball hits the second billiard ball, there’s a non-zero probability that the second billiard ball will spontaneously end up in the next town over. Obviously, this probability is very small, but the important fact is that it’s non-zero. I would say that any process that has multiple possible outcomes, where each outcome has a non-zero probability of occurring, is a chancy process, and thus billiard ball interactions are chancy. The same holds for flowing water forming canyons, and so forth. the natural Oklo nuclear reactor which you vaguely mentioned was not the product of “chance”, it was just the right combination of uranium ore coming into contact with groundwater. But what accounts for the existence of the right amount of uranium ore in that location? And what accounts for the existence of the groundwater in that location? There are complex physical processes that led to those events occurring, and (given a fully determinstic theory of physics) those complex physical processes can be traced back to the initial state of the universe (assuming, that is, that the universe had an initial state). So now we can ask the question: why did the universe have that initial state, as opposed to some other initial state that wouldn’t have led to the natural Oklo nuclear reactor? Presumably there was no quantum phenomenon that led to probabilities for the various possibilities for the initial conditions. But in the absence of a designer, my opinion is that it makes sense to hold that it was a matter of chance that the initial conditions of the universe were what they were. And thus, it makes sense to hold that physical processes that happen as a result of the initial conditions being what they are are chancy physical processes. Suppose I did start using the “natural causes” terminology instead, as Matzke recommends. I’d still be opening myself to critique. Prominent philosopher of physics John Norton has argued that the notion of causation is a folk scientific notion; it’s not a concept that one gets from fundamental physics. Thus, if I started using the “natural causes” terminology, I could see someone who has read Norton complaining that I shouldn’t be thinking in terms of folk science; I should be thinking in terms of fundamental physics, and in fundamental physics causation plays no role. In sum, as is so typical with language, there may not be an ideal term to exactly capture what intelligent design proponents mean by “chance” and what Matzke means by “natural causes”. But that doesn’t matter, as long as we understand what we’re talking about. The question of how we detect design is a question that both atheists and theists can equally well engage in. The question comes up when one is engaged in the project of looking for scientific evidence for the existence of a supernatural God, but the question also comes up when, for example, one ponders what structures one would have to find on a planet for one to conclude that the planet is probably inhabited by intelligent aliens. By “mind-affinity”, Ratzsch is getting at patterns that match patterns that a mind would be expected to create. For example, if we saw “John 3:16” spelled out using rocks on the side of a mountain, we would think that that distribution of rocks was the pattern of design, not chance. With value-affinity, Ratzsch is talking about effects that an agent would want to realize in the course of realizing some value. For example, there is evidence that in the distant past there was a nuclear reaction that happened in a river, not as a product of human agency. If that reaction didn’t have any substantive effects, we would probably conclude that the reaction happened as a result of chance processes. But if that reaction was causally efficacious in producing intelligence in human ancestors, and intelligence couldn’t have been produced any other way, we would think it more probable that the reaction happened as a result of design. In my opinion, Ratzsch is giving a more promising answer than Dembski. Ratzsch’s discussion of mind-affinity and value-affinity on pages 61-69 of his book Nature, Design, and Science is quite brilliant. It’s disappointing that the intelligent design literature focusses on Dembski’s answer and not Ratzsch’s. I won’t try to reproduce Ratzsch’s argument for that claim here; I’ll just encourage you to look at the book (Nature, Design, and Science) if you’re interested. If I were to argue for this claim, I’d give a Bayesian argument — if some hypothesis can account for some piece of evidence, and is confirmed by that evidence, then introduction of another hypothesis that can also confirm the evidence doesn’t stop the evidence from providing some confirmation for the first hypothesis, even though the degree of confirmation would go down. 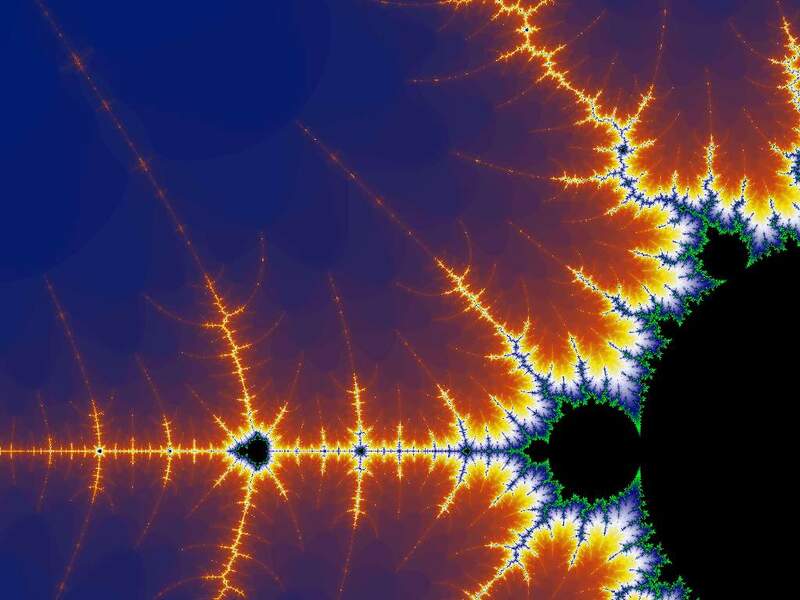 Why isn’t the Mandelbrot set evidence for design? Comments Off on Why isn’t the Mandelbrot set evidence for design? I should note that, in practice, Mandelbrot sets are produced by designers — the people who wrote the computer program to produce them. What I’m interested in is if we (somehow) came across something like a Mandelbrot set in nature — say, in the pattern of a leaf. Would that pattern provide evidence for the existence of God? To read more about these sorts of issues, see my new book, Seeking God in Science: An Atheist Defends Intelligent Design. What would count as evidence for God? Comments Off on What would count as evidence for God? One might initially think, if walking upon a heath and coming across a cube of pyrite, that that cube was an artifact produced by design. But in fact, that cube has the same status as any random rock one finds on the heath. Given the existence of pyrite cubes on Earth, I wouldn’t know what to think if I came across a titanium cube on Mars. If there were processes which were only activated by energy beyond what any finite agency could generate — for example, infinite energy — such processes would thus constitute evidence that supernatural agency was involved. Granted, Ratzsch just says that the process would “constitute evidence”, not that that process would constitute certain evidence, so perhaps I would agree with him, in that perhaps I would take such a process to constitute a tiny bit of evidence for supernatural agency. But I’m not even sure that I would do that. There are some aspects of the universe that physicists talk about, such as spacetime singularities and black holes and supertasks, where there are ways of looking at these aspects such that they involve infinities. Perhaps there are parts of the universe where the amount of energy is infinite. If I had to guess, I’d guess that that wasn’t the case, but if the physicists told me that that was the case, I don’t think I would take that as evidence for the existence of God; I’d just say that that’s another interesting fact that we’ve learned from physics. However, I agree with Ratzsch’s overall point, that one can in principle get evidence for the existence of God. I argue for that a bit in this paper.